Later, Lindsay treated me to lunch. We have found an “all you can eat Sushi” spot that is actually quite amazing. At $12.99 it is hard to beat. If you are in Toronto, try it out– California Roll on Bayview. Even Maddie the 2 year old loves the seaweed salad , edemame and rice. She handles chop sticks better than some adults I know. In the evening we took a neighbourhood stroll and ended up at one of those fresh ground, organic and locally sourced burger joints that opened up last year next to some grotty old school noodle joints. Still it’s fun to see all the variety out there. 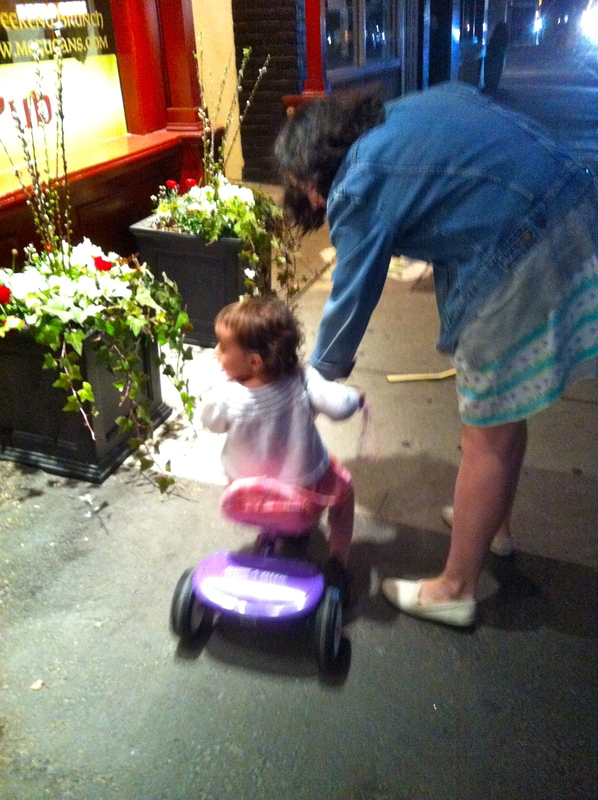 Madeline insisted on pedalling her miniature bike the entire way. Since she is still pretty shrimpy and the bike is very low, it was quite a feat to keep her on track through the craggy sidewalks and over the street car tracks. 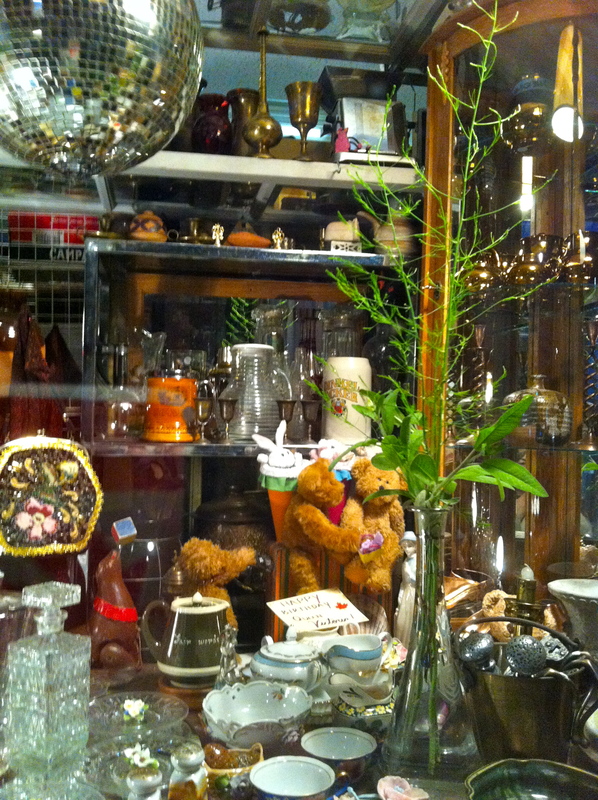 There are two junk stores that we pass by everyday. It’s hard to believe that purchases have ever taken place in either store, but I must say the fully lit windows in the evening looked weirdly magical tonight. It’s difficult to assertion any regular retail hours since the hand lettered signage is spare on details, but every once in a while a pile of junk ends up on the sidewalk signalling they are open for business. 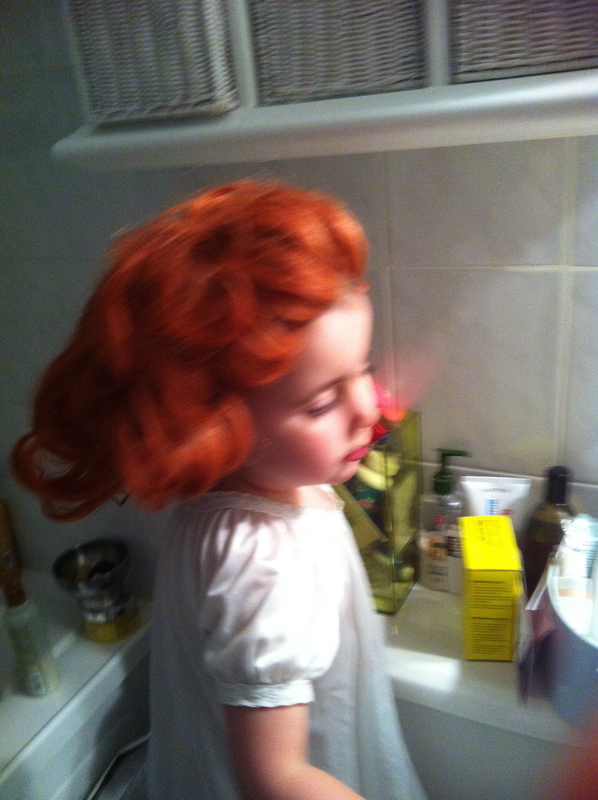 And finally, bedtime brought out the Gramma Wood wig. It’s a family favorite. This legendary matriarch of the Harker Family, Ione Wood, dyed her hair red almost to her last days on earth. She was one amazing woman and she always sported good shoes, a matching purse and a professionally styled hair-do that had been sprayed to last a week. The wig apparently came in handy after swimming. For some reason little kids cannot resist it’s charms. She was Gramma Wood to all who knew her, regardless of actual family ties. I miss her always and suspect that she is somehow watching over all the kids still, and likely squirrelling away liquorice and quarters for the next time we all meet.